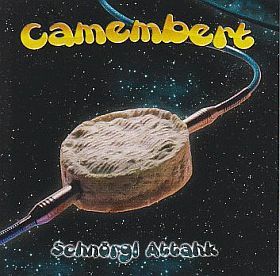 Camembert is a french Progressive Jazz Fusion band from Strasbourg (France). The band is articulated around very original instruments such as Harp, Xylophone and Vibraphone. The band's aim is to abolish frontiers between musical styles by including some world music arrangements. The best definition of their music heard in the press as the meeting between Henry Cow and Herbie Hancock for the writing of a blaxploitation movie soundtrack. You will hear blends of Zappa, King Crimson, Pat Metheny, George Duke, Hemeto Pascoal, Ennio Morricone and Gentle Giant in the Cheese very uncommon compositions. Signed on Altrock Label, the band released its first album Schnörgl Attahk in September 2011. This first opus is based on a delirious story of an alien invasion (The dirty stupid Schnörgls commanded by the abominable Dr Frankenschnörgl) on Earth. Then, a giant starship made Cheese enters Earth Orbit and abducts people and animals on Earth to transform them into super soldiers and resist against the Schnörgl oppression. With a featuring from Francesco Zago from Yugen and a zappaian style booklet made by Paolo Ske Botta from Ske, Schnörgl Attahk is a pamphlet for the reniewing of modern progressive rock and Jazz Fusion. Enjoy the smell of this cheese!